In addition to its own conferences and activities with its members, the International Environment Forum is engaged in international processes at the United Nations and elsewhere and often partners with other Non-Governmental Organizations with similar aims and values. Some of these activities are described below. The IEF has been accredited by the United Nations to its major conferences on sustainable development since 2002 in the Science and Technology major group. UN Environment (formerly UNEP) invited the IEF to represent the Bahá'í Faith in a Consultation meeting on Engaging with Faith-Based Organizations in Nairobi on 30 November 2017 (see separate report). A large team of IEF members participated in the 21st Conference of the Parties to the UN Framework Convention on Climate Change in Paris, France, 30 November-12 December 2015, where the ambitious Paris Agreement was finalized. It organized or cosponsored 5 side events. See the separate illustrated report on the five parallel and side events organized by IEF and the Baha'i Community. The IEF was accredited to UNCSD and contributed actively to its preparation. It submitted proposals to the bureau for the zero draft at the end of October 2011 (http://www.uncsd2012.org/rio20/index.php?page=view&type=510&nr=166&menu=20), and proposed a course for the SDlearning component of the conference on Values-based Leadership for Sustainability - Concepts and Capabilities (http://www.uncsd2012.org/rio20/index.php?page=view&type=700&nr=120&menu=23). With a delegation of 12 IEF members in Rio, it partnered with and contributed to a number of scientific forums, parallel events, and the Peoples' Summit in Rio. See the full report at https://iefworld.org/conf16. At least 14 IEF members participated in the 15th Conference of the Parties to the UN Framework Convention on Climate Change in Copenhagen, 7-18 December 2009. See the separate illustrated report on the involvement of the Baha'i International Community and the International Environment Forum in Copenhagen, as well as a paper by Arthur Dahl on Climate Ethics and the Copenhagen Summit summarizing some of the ideas we presented, and reflecting on the process. A number of IEF members attended the 16th Session of the United Nations Commission on Sustainable Development in New York in May 2008. Among the activities in which they were involved was the presentation of the SAT programme (System of Tutorial Learning) of FUNDAEC of Colombia (http://www.fundaec.org/en/programs/sat/) as a best practice model for the development of capabilities for sustainable rural development, at the Learning Center at UN Headquarters during the CSD-16 Review Session. On 8 May 2008, Duncan Hanks, the executive director of the Canadian Bahá’í International Development Agency (CBIDA) (and IEF board member) moderated a three hour interactive workshop featuring two representatives of the Bayan Association (Honduras) and a faculty member of the University of California (Berkeley). The SAT programme in Honduras and Colombia has reached over 100,000 direct beneficiaries since its inception, and in the past ten years has received substantial investments from the Canadian International Development Agency (Partnership Division) and CBIDA through jointly funded projects. Over 70 representatives of country delegations and the civil society attended the event. According to Mrs. Hiroko Morita-Lou, Coordinator of the CSD-16 Learning Centre, the presentation on the SAT programme was among the best attended of all the CSD-16 learning events to date. Among the attendees was His Excellency Mr. Marco A. Suazo, Ambassador, Deputy Permanent Representative of Honduras to the United Nations. At one point, Mr. Suazo was so moved by the presentation that he interrupted the workshop to express his profound appreciation for the contribution SAT is making to his country. The CSD Learning Centre coordination team will be finalizing its summary, and the final submission to the Commission will further underscore the importance of increased investment and attention to building capacity of rural youth and women to contribute to the sustainable development of their communities and regions. At the 15th sesssion of the Commission on Sustainable Development in April-May 2007, the IEF again had a number of members present, including Peter Adriance, Beth Bowen, Arthur Dahl, Mark Griffin, Paula Posas and support from Sylvia Karlsson in the Finnish delegation. Halldor Thorgiersson also attended one day in his role as Deputy Executive Secretary of UNFCCC. We collaborated closely with the Bahá'í International Community which helped with accreditation. The highlight was an official side event on Monday 30 April on "The Ethical Dimensions of Climate Change" organized by the Bahá'í International Community with the Permanent Missions of Tuvalu and of the Marshall Islands, and co-sponsored by the UN Office of High Representative for the Least Developed Countries, Landlocked Developing States and Small Island Developing States (UN-OHRLLS); the UNEP Interfaith Partnership for the Environment; Rock Ethics Institute at Penn State University; International Environment Forum; and the NGO Committee on Sustainable Development. The event, held in the UN Building on the first day of CSD-15, filled the room with over 90 people, including the Minister and other delegation members from Tuvalu. There were presentations by H.E. Mr. Enele Sosene Sopoaga, Former Ambassador and Permanent Representative of Tuvalu to the UN, Mr. Om Pradhan of the UN-OHRLLS, Mr. Tony Barnston of the International Research Institute for Climate and Society, Columbia University; Mr. Don Brown of the Collaborate Program on the Ethical Dimensions of Climate Change, Rock Ethics Institute; Dr. Arthur Dahl of IEF; and Rabbi Lawrence Troster, Fellowship Programme Director of GreenFaith. The event was covered in full page articles in the two CSD newsletters, Outreach Issues for Tuesday, May 1, page 6 (download pdf from http://www.anped.org/index.php?part=112) and ENB on the side (http://www.iisd.ca/csd/csd15/enbots/pdf/enbots0511e.pdf) and video recordings of all the speakers were posted on YouTube (http://www.youtube.com/profile_videos?user=martha04032). Information is also available on the BIC web site (http://www.bic.org) and the IISD site has more pictures and captions (http://www.iisd.ca/csd/csd15/enbots/30apr2007.html). A White Paper on the Ethical Dimensions of Climate Change prepared by the Rock Ethics Institute ( http://rockethics.psu.edu/climate/whitepaper/whitepaper-intro.shtml) was distributed at the event. There was also coverage on the Bahá'í World News Service (http://news.bahai.org/story/530), and an article appeared in One Country (http://www.onecountry.org/e191/e19104as_CSD_story.html). We were also able to continue our involvement with the Science and Technology Major Group and the Education Caucus. A new SCOPE book on Sustainability Indicators: A Scientific Assessment, co-edited by Arthur Dahl and with a chapter by Sylvia Karlsson, was distributed by UNEP and UNESCO to all the CSD delegations. In May 2006, seven IEF members were active in the Commission on Sustainable Development (CSD-14) which provided thematic coverage of energy, air pollution, industrial development and climate change. Arthur Dahl and Mark Griffin were the IEF representatives accredited through the Bahá'í International Community (BIC), while Peter Adriance represented the Bahá'í International Community itself. Sylvia Karlsson was in the Finnish delegation, and Beth Bowen represented the International Association of Physicians for the Environment. Halldor Thorgiersson, as Deputy Executive Secretary of the UN Framework Convention on Climate Change, was an expert panellist in one of the main commission sessions, and Minu Hemmati was in the IUCN delegation. The IEF prepared and distributed two statements on "Ethics and the Energy Challenge" and "Air Pollution - A Broader Perspective". IEF also assisted in the drafting of an article on " Summoning the Will for Sustainable Development" by Peter Adriance for BIC in the daily newsletter Outreach 2015 published by Stakeholder Forum (see p. 4 in http://www.stakeholderforum.org/news/outreach/csd14/Wednesday3May.pdf, or download it here). Sylvia Karlsson gave a talk on "Short-term Sacrifices for Long-term Gains - How Do We Change the Time Horizon of Governments?" for the Earth Values Caucus, from which she prepared an article for Outreach 2015 published on the opening day of the ministerial segment (see p. 5 in http://www.stakeholderforum.org/news/outreach/csd14/Wednesday10May.pdf, or download it here). IEF was active in supporting the Science and Technology Major Group and Education Caucus activities, with both of whom we are closely associated. A policy brief on indicators of sustainability that Arthur Dahl had drafted for SCOPE was distributed by UNESCO to all the delegations. At the Mauritius International Meeting on Small Island Developing States (Port Louis, Mauritius, 10-14 January 2005), the IEF co-sponsored a parallel event with the Education Caucus, Stakeholder Forum and other partners, and assisted the Bahá'í Community of Mauritius to prepare a statement for the meeting. See separate report. 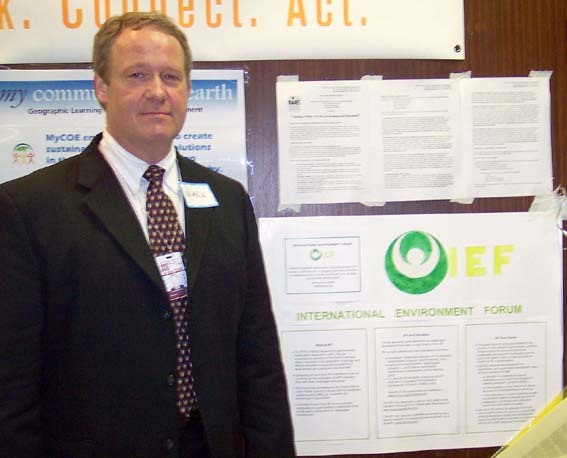 The IEF again participated actively in the Commission on Sustainable Development (CSD-13) in 2005, with the same delegation as in 2004, reinforced by IEF board member Peter Adriance who represented the Bahá'í International Community. The IEF collaborates with the Science and Technology Major Group, and in the activities of the Education Caucus, among others. The IEF sent a balanced scientific delegation to the Commission on Sustainable Development (CSD-12) in New York in April 2004 on the theme of water, sanitation and human settlements. The delegation, consisting of Sylvia Karlsson Ph.D. (social sciences), Arthur Dahl Ph.D. (natural sciences), Elizabeth Bowen MD, Ed.D. (health sciences) and Mark Griffin M.E. (water and sanitation engineering - see photo), participated in a number of side events and NGO activities as well as following the Commission sessions. IEF co-sponsored a reception and networking session organized by the Bahá'í International Community in anticipation of the UN Decade of Education for Sustainable Development, and prepared and circulated two statements on Water and Sanitation: an Integrated Approach and on Sustainable Human Settlements: an Integrated Approach. The UNESCO Centre for Women and Peace in the Balkan Countries co-sponsored the 8th IEF Conference in Thessaloniki, Greece, 15-17 October 2004, on Cultivating Sustainable Lifestyles. The IEF was accredited by the United Nations to the World Summit on Sustainable Development (Johannesburg, August-September 2002) as a scientific and technological organization. It sent delegations to participate in preparatory committee meetings at CSD-10 (New York, 2002) and Bali (May 2002), and had 14 members in Johannesburg supporting four parallel events organized by IEF and an exhibit at the Global Peoples' Forum. It prepared statements on Indicators for Sustainability, Education and Values for Sustainable Development, Integrating Science in Local Communities, Values for Sustainable Development, and Multiple Dimensions of Globalization. See separate report. While the IEF did not exist to contribute to earlier UN conferences on the environment, the IEF President did participate in the United Nations Conference on the Human Environment in Stockholm, Sweden, in 1972, as the representative of the Bahá'í International Community, and as a member of the secretariat for the United Nations Conference on Environment and Development in Rio de Janeiro in 1992, he helped to draft its action plan Agenda 21. Other IEF members also participated in the Rio Earth Summit. The IEF has organized conferences and other activities in support of the decade even before it began, and contributed activities throughout the decade. See the separate DESD page. The IEF benefits from collaboration with other NGOs that share common views and that sometimes join in co-sponsoring activities. PERL succeeded the Consumer Citizenship Network funded by the European Union from 2004-2009, which included 123 partner institutions including many universities, consumer organizations and UNEP and UNESCO. After six further years of EU funding, it became a UNITWIN network with a UNESCO Chair of Education for Sustainable Living, and expanded with activities in Asia, Africa and Latin America. Both networks have been coordinated by IEF board member Victoria Thoresen, and have a permanent base at the Inland Norway University of Applied Sciences, Norway. The IEF became a member of CCN in 2005 and continues as an active member of PERL. IEF participates regularly in PERL activities, such as collective meetings of working groups in Rome (January 2010), Amsterdam (September 2010), Marseille (March 2013) and Sligo, Ireland (2015), and think tanks in London in January 2011, Paris in October 2011, Vienna in November 2015 and Paris in September 2017. The Partnership for Education and research about Responsible Living (PERL) held its 2nd International Conference at the Technical University in Berlin, Germany, on 19-20 March 2012, on the theme "Beyond Consumption: Pathways to Responsible Living". As usual, the International Environment Forum participated actively in the conference. Keynote speakers included Victoria Thoresen, PERL Project Coordinator (and IEF board member), speaking on "Concern, Compassion and Commitment: Keys to Responsible Living". 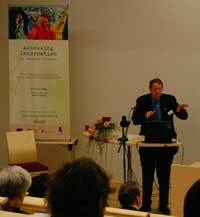 Sixty presentations were given, including one by IEF President Arthur Dahl on "Alternatives to the Consumer Society". Arthur also presented a poster on "Enabling Action at Rio+20". PERL organized its 1st International Conference in Turkey in March 2011, preceded by working group meetings, with active IEF participation. The conference, at Maltepe University in Istanbul, Turkey, on 14-15 March 2011, had as its theme "Enabling Responsible Living". IEF board member and PERL Director Victoria Thoresen gave an opening keynote and a paper on "Exchange, Empathy, Encouragement and Enabling - Keys to Collaborative Progress Towards Responsible Living". Onno Vinkhuyzen and Sylvia Karlsson-Vinkhuyzen gave a paper on "The Role of Leadership in Responsible Living". Arthur Dahl presented papers on "Multi-level Frameworks to Enable Responsible Living" and on "Values-based Indicators for Responsible Living". At the Fifth CCN Conference in Tallinn, Estonia (May 2008) with the theme "Assessing Information", three IEF members were again able to make specific contributions to the work of this network. Victoria Thoresen, coordinator of the Consumer Citizenship Network, gave an opening keynote talk on "To know or not to know...that is the question" and Arthur Dahl gave a keynote on "Assessing information at multiple scales - taking some burden off the consumer". He also participated in a symposium on "Indicators for sustainable consumption", and gave a workshop paper on "The ethical challenges of global change as a motivator for consumer citizenship". Sylvia Karlsson gave a paper on "Institutionalized knowledge challenges in pesticide governance: the end of knowledge and the beginning of values in governing globalized environmental issues". 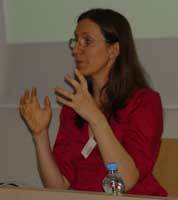 Arthur also contributed to the CCN Task Group on indicators which met before the conference. At the Fourth CCN Conference in Sofia, Bulgaria, in May 2007 on the theme "Building Bridges", encouraging stakeholder involvement and transdisciplinary cooperation in consumer education", IEF member Greg Dahl gave a keynote address on "Globalization: Transforming Our World," drawing on his recently-published book, One World, One People: How Globalization is Shaping Our Future. 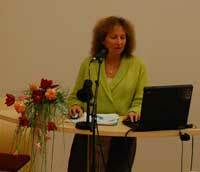 In May 2006, the IEF organized a plenary symposium on "Fostering Commitment and Consistency" at the Third CCN Conference in Hamar, Norway. Arthur Dahl spoke on "Scientific Foundations for Commitment and Consistency", Wendi Momen spoke on "Values Underlying Commitment and Consistency", and Sylvia Karlsson concluded with "Institutionalizing Sustainable Consumption". This was followed by a lively panel discussion with the 130 participants. Sylvia Karlsson (see photo in CCN workshop) also gave the conference an update on the Commission on Sustainable Development 2006 Session, and the IEF prepared a poster display on the US Partnership for the Decade of Education for Sustainable Development to share experience across the Atlantic. Two of the IEF symposium papers were published in the conference proceedings: Dag Tangen and Victoria W. Thoresen (eds. ), Catalyzing Change. 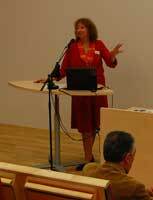 Proceedings of the Third International Conference of The Consumer Citizenship Network, Hamar (Norway) 2006. Høgskolen i Hedmark, Oppdragsrapport nr. 4 - 2007. The IEF participated in the First Consumer Citizenship Network Conference at UNESCO in Paris, 1-2 March 2004, where Arthur Dahl was a workshop speaker on "Science and values as complementary foundations for consumer citizenship". IEF and ebbf (formerly European Bahá'í Business Forum) have collaborated closely for many years and have held conferences together. ebbf and IEF co-sponsored a seminar on Multiple Dimensions of Globalization at the World Summit on Sustainable Development (WSSD) in Johannesburg in 2002 (see photo of Iraj Abedian and Arthur Dahl, two of the speakers). They also shared a joint exhibit at the associated Global Peoples' Forum. The two Bahá'í-inspired organizations share a common interest in sustainable development and maintain a continuing partnership in this area. They collaborated again in a course on sustainable development offered through the Wilmette Institute in October 2005-January 2006, October 2006-January 2007, and October 2009-January 2010, and still continuing. In September 2008, EBBF and IEF held a combined annual conference in the Netherlands (see separate report), and in October 2013 in Barcelona. The ECPD is affiliated with the University for Peace chartered by the United Nations. IEF through its president began contributing in 2008 to the ECPD annual conferences on National and Inter-Ethnic Reconciliation, Religious Tolerance and Human Security in the Balkans, in Milocer, Montenegro in 2008 and Brioni Islands, Croatia in October 2009, where he spoke on Human Security and Climate Change: The Ethical Challenge. In 2010, the conference was again in the Brioni Islands on the theme "Human security and the role of interstate collaboration". Arthur Dahl co-chaired a session and presented a paper on "Interstate collaboration and human security: lessons from Copenhagen". The 2011 conference was in Milocer, Montenegro, on 20-22 October, and Arthur Dahl's paper was on "European Union and Global Sustainability: Issues for Rio+20". ECPD met at the Belgrade, Serbia, City Hall on 20 October 2012 on "New Balkans in a Changing World with a Changing Europe", and Arthur Dahl's presentation was on the "Right of Each Human Being to Enjoy Peace, Security and Welfare". He has now been named to the ECPD Academic Council.The ECPD conferences continue annually in Belgrade with IEF participation. Stakeholder Forum co-sponsored and provided a facilitator for the IEF panel discussion and dialogue on Indicators for Sustainability in the Science Forum at WSSD, and its Executive Director, Felix Dodds, was a speaker at the IEF/EBBF seminar on Multiple Dimensions of Globalization at WSSD, Johannesburg, 2002. Stakeholder Forum also co-sponsored with IEF and the Education Caucus a parallel event at the Mauritius International Meeting, January 2005. In 2010, we contributed to a Stakeholder Forum event at the 2nd Preparatory Committee for Rio+20 in New York in February 2010, and co-sponsored a side event at Rio+20 in 2012. The IEF held three annual conferences (2000, 2003 and 2005) and other smaller sessions (2001, 2004, 2006) at the annual Seminar/Conference on Social and Economic Development in the Americas organized by the Rabbani Trust in Orlando, Florida, USA. At the 2008 Conference on the theme of sustainable development, the whole Saturday morning was devoted to climate change and its multiple dimensions, chaired by IEF board member Peter Adriance, and including IEF members Arthur Dahl, Halldor Thorgeirsson and Duncan Hanks, and Baha'i International Community representative Tahireh Naylor-Thimm. The audio recordings of this session can be downloaded here. The IEF was invited by the Centre UNESCO de Catalunya to participate in the International Experts Workshop on Faith-based Organizations and Education for Sustainability, held in Barcelona, Spain, on 22-24 March 2007, where Arthur Dahl presented the Bahá'í perspective and the work of IEF on education for sustainability. Download the report of the workshop (pdf 250 kb). • Prof. Peter G. Brown of McGill University's School of Environment, author of Restoring the Public Trust, The Commonwealth of Life, and Right Relationship: Building a Whole Earth Economy, was a keynote speaker at the 13th IEF Conference in Washington, D.C. in 2009. • Dr. Felix Dodds, Executive Director of the Stakeholder Forum for Our Common Future, London, reviewed political and governance issues in the IEF seminar on Multiple Dimensions of Globalization, Johannesburg, 2002. • Gary Gardner, WorldWatch Institute, Washington, D.C. was keynote speaker on "Invoking the Spirit: Engaging Religion and Spirituality in the Quest for a Sustainable World" at the IEF Conference 2003. • Mr. Jan Juffermans, from De Kleine Aarde (The Small Earth), The Netherlands, spoke on the Ecological Footprint at the IEF Conference 1998. • Dr. Augusto Lopez-Claros, then the Chief Economist and Director, Global Competitiveness Programme at the World Economic Forum, spoke at the IEF Conference 1999 in the United Kingdom on Governance in the 21st Century, and was again a keynote speaker at the 10th IEF Conference at Oxford University in 2006. • Prof. Bedrich Moldan, Director, Environment Centre, Charles University, Prague, former Czech Minister for the Environment and former President of the UN Commission on Sustainable Development, was the keynote speaker at the IEF Conference 2001, and a panelist at the IEF Dialogue on Indicators for Sustainability at the World Summit on Sustainable Development in Johannesburg in 2002. • Prof. John Stone, Adjunct Research Professor, Geography and Environmental Studies, Carleton University, Canada, and vice-chair of working groups in the Nobel-Prize-winning Intergovernmental Panel on Climate Change, gave the opening talk at the 11th IEF Conference in Ottawa, Canada in 2007. • Dr. Halldor Thorgeirsson, Deputy Executive Secretary of the UN Framework Convention on Climate Change, Bonn, Germany was a keynote speaker at the 10th IEF Conference at Oxford University in 2006 and in the Climate Change plenary at the Bahâ'î Conference on Social and Economic Development in Orlando, Florida in December 2008. • Several outside speakers including Assistant Professor Dr. Eftichios Sartzetakis, University of Macedonia (Greece), Dr. Konstantia Tamoutseli, Advisor on Environmental Education (Greece), Mr. G. Tosikas, Head of Transport Planning, Thessaloniki (Greece), Mr. A. Tzitzikosta (Greece), and Dr. Christos Vasilikiotis (USA) participated in the IEF Conference 2004 in Thessaloniki, Greece. • The Bahá'í International Community adopted a Seven Year Plan for Action on Climate Change as a contribution to the Alliance of Religions and Conservation (ARC)/UNDP programme for action plans from nine major religions launched in November 2009 before the Copenhagen climate change meeting in December 2009. At the launch at a celebration at Windsor Castle, the BIC representatives Tahirih Naylor and Arthur Dahl (President of IEF) received certificates of appreciation from HRH Prince Philip and UN Secretary-General Ban Ki-moon (right ARC/Richard Stonehouse photo). More information on the event and summaries of the action plans are here and on the event web site (http://www.windsor2009.org/). The IEF collaborated with the Bahá'í International Community on this project and prepared materials in support of the action plan. See the climate change page. IEF members also supported the BIC delegation to the UN Climate Change Conference in Copenhagen 7-18 December 2009 (see separate report). Both the Plan for Action on Climate Change and a recent BIC statement "Rethinking Prosperity: Forging Alternatives to a Culture of Consumerism" specifically cite the IEF and its activities. IEF members served on the Bahá'í delegation to the Paris Climate Change Conference in December 2015, where IEF organized several parallel activities at the conference. • The BIC referred its national affiliates to the IEF web page of information on the World Summit on Sustainable Development to encourage involvement of Bahá'í communities in national preparations for the Summit held in Johannesburg in 2002. The IEF and BIC collaborated in their activities at the Summit, and coordinated information on their parallel activities. Both had exhibits in the NGO forum. • The BIC featured information on the IEF as an example of practical action for environment and sustainable development in its exposition at the European Parliament in Brussels and Strasbourg (2003-2004). • The IEF focussed its annual conference in 2003 and in 2005 on preparations for the UN Decade on Education for Sustainable Development to assist the national Bahá'í communities in the USA and Canada with their own preparations for the Decade, and created a web page of information on the DESD to assist those and other communities and organizations. It has continued to co-sponsor activities in the USA in support of the DESD, including a seminar in 2006. • The IEF co-sponsored a reception and networking session on the UN Decade on Education for Sustainable Development organized by the BIC at the UN Commission for Sustainable Development (CSD), New York, 26 April 2004, and co-sponsored a side event on 30 April 2007 at the 15th session of the CSD on the topic "Ethical Dimensions of Climate Change" with Arthur Dahl as one of the panelists. • The IEF has co-sponsored seminars on Education for Sustainable Development at the Bahá'í Conference on Social and Economic Development in the Americas, Orlando, Florida, in December 2003, 2004, 2005 and 2006. The national Bahá'í administrative body of the United States wrote a letter (also available as pdf) to all the American Bahá'í community on 25 February 2010 informing them of the Bahá'í International Community Seven Year Plan of Action on Climate Change and encouraging them to study and reflect on the Bahá'í teachings on the environment and to incorporate greater awareness of the environment in their community life and core activities. They included the IEF web site among the resources available. A second message was sent in 2011. In March 2012, a third message on climate change was sent to raise awareness of the moral dimensions of this issue and to call for specific actions during Earth Week (22-29 April 2012). In January 2013, they again wrote to the American Baha'i community about the action plan on climate change, and encouraged continued learning and reflection on the problem through the Wilmette Institute's eight week course on climate change (based on the IEF course) and the National Preach-in on Global Warming sponsored by Interfaith Power and Light (8-10 February 2013) where relevant Baha'i materials are available. This event was renamed Faith Climate Action Week in 2016, and another message was sent in March 2016 encouraging all Baha'i communities to participate. The IEF has designed and co-sponsored a distance-learning course on Sustainable Development and the Prosperity of Humankind offered through the Wilmette Institute On-line Baha'i Learning Center almost every year since 2005. All the faculty have been members of IEF. The IEF interfaith course on Scientific and Spiritual Dimensions of Climate Change (https://iefworld.org/ssdcc0.html) has also been adapted for the Wilmette Institute in 2013 as mentioned above and is now offered every year. The IEF has co-sponsored activities of the US Bahá'í Community on Education for Sustainable Development. The Bahá'í Community of Canada collaborated with IEF in the organization of its 11th Conference in Ottawa on 12-14 October 2007 on the theme "Responding to Climate Change: Scientific Realities, Spiritual Imperatives." 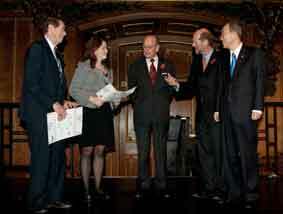 One result was a letter in March 2008 from the Canadian national Bahá'í administrative body to all local communities calling attention to the pressing global challenge of climate change and asking them to demonstrate ever-increasing sensitivity to environmental issues in the design and implementation of community activities. A further letter was sent in July 2009 along with suggestions for greening community activities, and another letterin October 2009 drawing attention to the Bahá'ís joining a global plan for "generational change" on climate change. The National Spiritual Assembly of the Bahá'ís of Canada has also designated specific advisers on the environment, sustainable development and climate change. 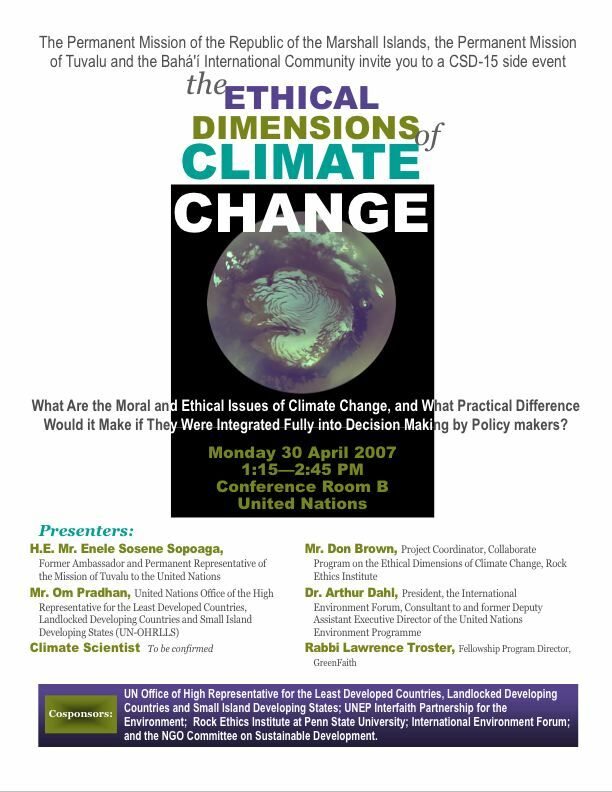 The Canadian Baha'i community has also participated in events on climate change as a moral issue, including a two-day meeting in mid-April 2010 (see http://www.bahainews.ca/en/100525-climatechange). In October 2011, the Bahá’í Community of Canada joined dozens of other faith communities and leaders in calling for new approaches to address the challenge of climate change (see full press release). The national Bahá'í administrative body of Australia supported the 15th IEF Annual Conference in Hobart, Tasmania, on 10-11 December 2011 to help launch the development of an Environmental Sustainability Strategy for the Australian Bahá'í Community. It wrote to all the Bahá'í communities in Australia to encourage them to participate in the conference, as did the Bahá'í community of New Zealand. A Bahá'í film crew from New Zealand came to the conference to make a film for New Zealand television. See the trailer at http://www.youtube.com/watch?v=pU-BWKO8_00&feature=channel. • The Bahá'í Agency for Social and Economic Development (BASED-UK) in the United Kingdom co-organized the third IEF Conference in 1999, requested the advice of IEF members on its future strategy in 2005, and again co-organized the 10th IEF Conference in England in 2006. • The IEF through its president assisted the Bahá'í Community of Mauritius with a statement and other activities at the UN Mauritius International Meeting on Small Island Developing States in, Port Louis, Mauritius, 6-14 January 2005. 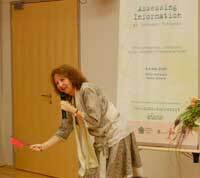 • The IEF assisted the national Bahá'í community in Germany with materials for a statement on climate change.